"Chopped flank steak cooked with garlic and fresh ginger tops fresh salad greens, colorful bell peppers, cucumber, and snap peas dressed with a zesty ginger dressing." Combine beef, oil, garlic and ginger in medium bowl; toss to coat evenly. Season with salt and pepper, to taste. Cook beef mixture in nonstick skillet over medium-high heat, saute beef until thoroughly cooked. 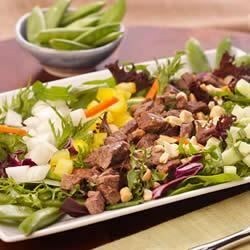 Using slotted spoon, place beef in medium bowl, mix with 2 tablespoons Gingered Dressing. Combine salad blend, snap peas from pouch, bell pepper, onion and cucumber in large bowl. Toss with Gingered Dressing, to taste. Transfer salad to serving platter or serving plates. Spoon beef over salad. Sprinkle on top chopped peanuts and cilantro. Squeeze lime wedges over, as desired. *Gingered Dressing: Whisk together 1/4 cup reduced sodium soy sauce, 1/4 cup rice vinegar, 1-inch piece peeled fresh ginger, grated, 2 tablespoons chopped fresh cilantro, 1 tablespoon sesame oil and 2 teaspoons chile paste with garlic until well blended. Makes about 2/3 cup.